After an injury-shortened season with the Nor’easters, Collishaw found a new home at Lindsey Wilson College and after he earned his second All-American honor in just 12 games, he is ready to take his talents to the pros. Or, more accurately, back to the pros. With one more year of college eligibility remaining, Collishaw has been in touch with several pro teams from Major League Soccer (MLS) and the United Soccer League (USL). 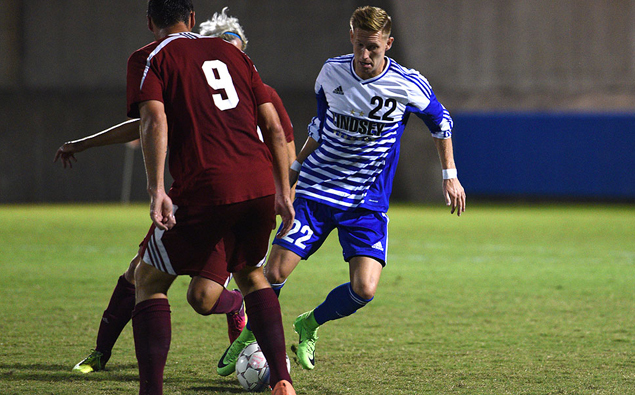 Even though he only played in half of the Blue Raiders’ games in 2017, Collishaw scored 21 goals, dished out five assists, and was named Co-Player of the Year in the conference (along with another Ocean City Nor’easters alum Daniel Nimmo of Campbellsville University). His goal is be selected in January’s MLS SuperDraft and prove himself at the top level. Collishaw’s journey began at the age of 12 when he signed with Leeds United, which is famous for its youth academy. He worked his way up the ladder, eventually playing for United’s Under-14 team where he found himself playing against future stars like Paul Pogba (Manchester United), Ravel Morrison (Lazio), Tyler Blackett (Reading FC), and Jordan Pickford (Everton FC). Collishaw left Leeds United to sign with his hometown club Hull City where he would get a chance to play in bigger and bigger games. At the age of 14, he was given more opportunities to compete at a high level as he played as far up as the club’s Under-18 team. At 16, he was given a chance to play against Stoke City in the FA Youth Cup at Britannia Stadium (now bet365 Stadium), as well as competing in the prestigious Milk Cup in Ireland. Collishaw’s performance at the Milk Cup got the attention of a former coach from Leeds United, Dave Harrison, who had since moved on to be the Head of Recruitment at Manchester City. Collishaw signed a one-year youth team contract with Hull City, and later a one-year professional contract which gave him the opportunity to train, at the age of 17, with Hull City’s first team full of Premier League players. The following year, Collishaw left his hometown club to sign a two-year professional contract with Championship club Bristol City FC. He originally signed for the club’s Under-21 team, but gradually worked his way into training with the senior team and even made some first team appearances. While the contract was a tremendous opportunity for a teenager like Collishaw, it would ultimately affect his future prospects in the United States. 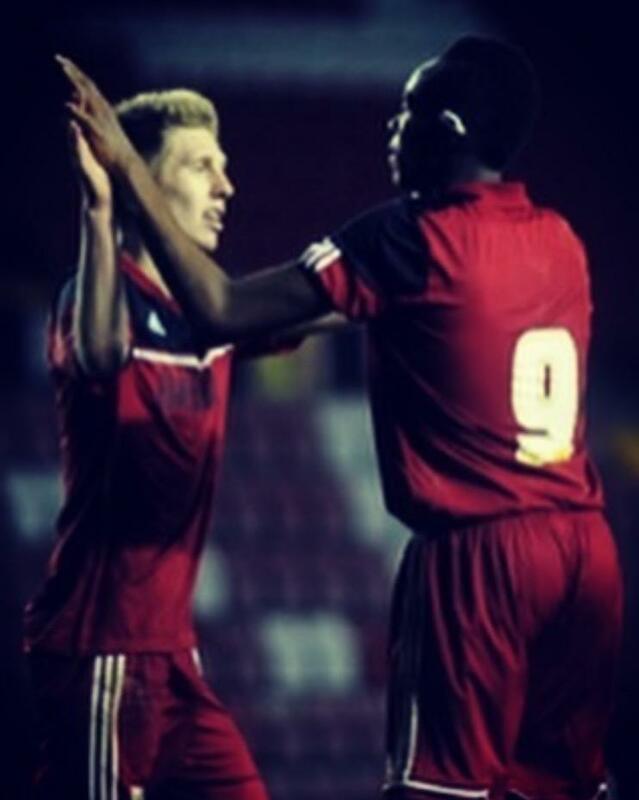 After his contract with Bristol City ended, his agent went on a mission to find the next step in his playing career. Collishaw explored opportunities in Tunisia with an African Champions League team, and went on trial with a first division club in Iceland, but some advice sent him to the United States. After attending a combine in the U.S., he received further advice that pointed him to playing college soccer as a path to the pros, while also getting an education. Unfortunately, because of his professional experience in England, that ruled out the possibility of playing for an NCAA school, which led him to explore his options in the National Association of Intercollegiate Athletics (NAIA). Davenport University (Grand Rapids, Mich.), the defending national champions, were happy to add Collishaw to their roster. After sitting out the 2015 season, he spent the summer of 2016 training with the Michigan Bucks as they eventually lifted the PDL championship trophy. Collishaw went back to college at Davenport where he helped the Panthers reach the NAIA national semifinals, where they lost in penalty kicks to eventual national champion Rio Grande (Ohio). Collishaw scored 12 goals and led the nation in assists with 19 en route to being named an NAIA All-American. 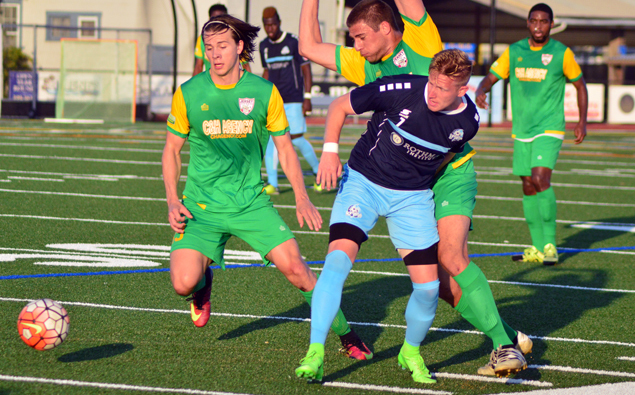 Following his successful debut with Davenport, Collishaw spent the summer of 2017 in Ocean City, NJ playing for the Ocean City Nor’easters. 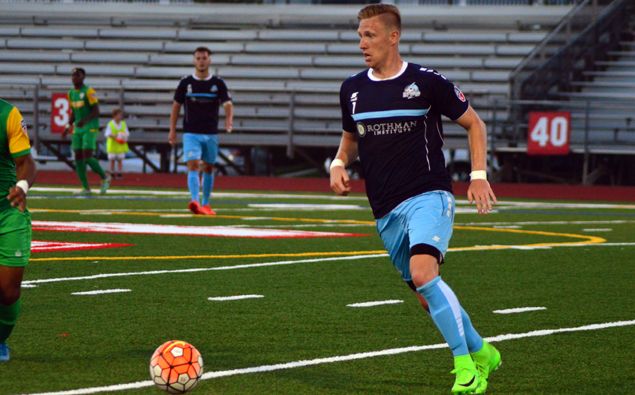 Unfortunately, after playing in two Lamar Hunt US Open Cup games, Collishaw suffered an injury that kept him limited to just four regular season games. The next fall, Collishaw found a new home in Kentucky with NAIA powerhouse Lindsey Wilson College, winners of nine national championships since 1995. There he joined fellow Ocean City Nor’easters alums Mutaya Mwape and Spencer Moeller to form one of the top offensive teams in the country. When Collishaw got off the plane in Kentucky, he ran into another roadblock to getting back on the field. A coach contacted Lindsey Wilson head coach Ray Wells to voice concerns about Collishaw’s eligibility. The school, wanting to play it safe, launched an investigation, which kept Collishaw confined to the practice field. Shortly before the team’s eighth game of the season, he was ruled eligible and it didn’t take long for him to make an impact. Collishaw made his season debut on Oct. 3 when the Blue Raiders traveled to Georgetown College (Ky.) and dismantled them, 10-0. Collishaw scored a pair of goals in his debut and followed that up with a hat trick three days later in a 6-2 home win over No. 23 Cumberland University. With five goals in his first two games, he earned national player of the week honors. For Wells, he already put together a very talented Blue Raiders squad (the team was 5-1 and ranked No. 11 nationally when Collishaw made his season debut), so to add a player like Collishaw was a huge bonus. Collishaw was more than just “effective”. He only played in seven regular season games, yet he scored or assisted on a goal in every game, finishing with 14 goals and two assists. Despite only playing half of the season, it was enough to split the Mid-South Conference Player of the Year award. Collishaw helped the Blue Raiders reach the championship game of the Mid-South tournament, falling 2-1 in overtime to No. 22 Cumberland University. Tyler scored five goals and dished out two assists in the three tournament games. 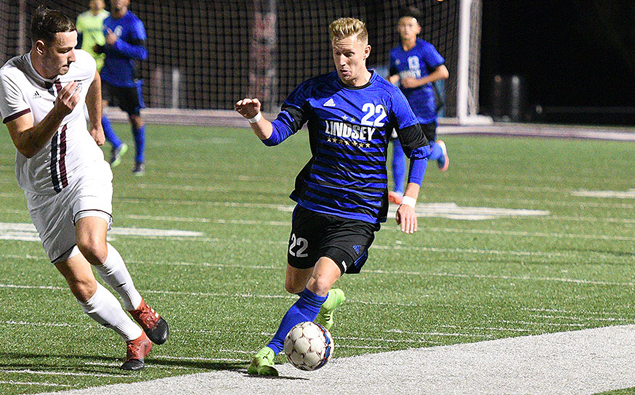 After a two-goal, one assist performance in a 5-2 opening round win over William Woods University, the Blue Raiders’ season would come to an end with a 1-0 loss to No. 17 Marymount California. Collishaw would finish the season with 21 goals and five assists in 12 games played, earning him NAIA First Team All-American honors (along with teammate Mutaya Mwape, who was named to the Third Team). Coach Wells said he would love to have Collishaw back next year to see what he could do over the course of a full season. However, he is quick to point out that he is not in the business of holding players back if they have what it takes to make a living playing the game that they love. "He's had a difficult road since being in the U.S, but it was what he wanted," said Martin Collishaw, Tyler's father. "Going out to America was a step which gave him a fresh start to prove himself again where no one new about him. It was a good challenge for him and a challenge in which he performs better as the underdog. He has been playing since he was really young and still has the same love for the game now. I'm looking forward to seeing how far he can go now." Collishaw’s goal is to be selected in January’s MLS SuperDraft in Philadelphia, but if he is not, he is confident that he will end up with a team. NAIA players selected in the any MLS draft (SuperDraft or Supplemental Draft) are rare with only seven players taken in the history of the league. Of those seven, only Steven Lenhart (Columbus Crew, San Jose Earthquakes) from Azusa Pacific University (Calif.) went on to play significant minutes for the team that drafted him (Columbus Crew SC). Between the Crew and the San Jose Earthquakes, he scored 41 goals in all competitions in 164 appearances before his career was cut short due to concussions. The last NAIA player drafted by an MLS team came from one of Collishaw’s stops: Davenport University. After winning national player of the year in high school, Dzenan Catic signed with FC Kaiserslautern in Germany, but never saw any first-team action. Catic returned home to Michigan where he, like Collishaw, signed to play at Davenport since he had professional experience on his resume. There he was a two-time All-American, won NAIA Player of the Year, led the Panthers to a national title, and won a PDL championship with the Michigan Bucks. He was drafted by the Philadelphia Union with the 31st overall pick but never played a game at the MLS level, and sat out the 2017 season with Rio Grande Valley Toros due to an injury. Collishaw is hoping to hear his name called on draft day so he can add another success story to the NAIA and to continue his soccer journey at the next level.